Figure 1. Aurora Borealis, an 1865 painting by Frederic Edwin Church. 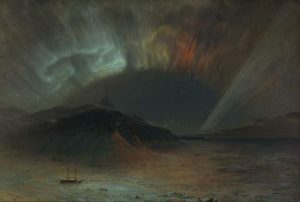 This and many other paintings by Church are posited to be inspired by the aurorae of the 1859 solar storm. Smithsonian American Art Museum. 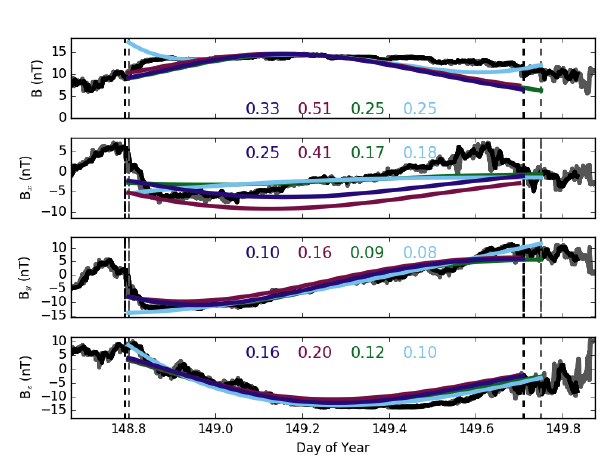 Enter the growing field of space weather forecasting. (You can check out today’s space weather forecast here!) Although we can’t stop the Sun from ejecting CMEs, we can try to figure out if a given CME will hit the Earth, and how severe the resulting geomagnetic storm will be if it does. The severity of a geomagnetic storm is linked to the CME’s magnetic field conditions, especially the magnitude of the southward-pointing magnetic field (i.e. the component of the magnetic field that opposes the Earth’s magnetic field at the equator). If the CME’s properties can be accurately estimated, the severity of the resulting geomagnetic storm can be estimated too, allowing for power grids and satellites to be put into safe mode if necessary. In today’s paper, the authors use simulations to determine the magnetic fields of CMEs at Earth based on the properties of the active region from which they erupt. They begin this process by determining the location of the CME eruption on the solar disk. Then, they extract the magnetic field properties of the eruption zone using magnetograms—maps of the magnetic field strength and direction across the solar surface. The solar magnetic field becomes an input parameter for Forecasting a CME’s Altered Trajectory (ForeCAT), which models the propagation of a CME through the solar corona. The CME may rotate, expand, or be deflected as it travels out, depending on how the Sun’s magnetic field is structured. The ForeCAT results are passed to the ForeCAT In situ Data Observer (FIDO), which simulates what two Earth-orbiting spacecraft, ACE and Wind, would observe as a CME passes over them. Figure 2. Comparison of in situ data (gray and black lines) and FIDO results. The ForeCAT-driven FIDO outputs discussed in this post are shown in dark blue. Three other models with different assumptions about the CME’s magnetic field are also plotted: graduated cylindrical shell (GCS) model-driven (purple) and two models where the CME is represented by a flux rope (green and light blue). The goodness-of-fit scores for each component and the total magnetic field strength are also listed; lower scores indicate a better fit. 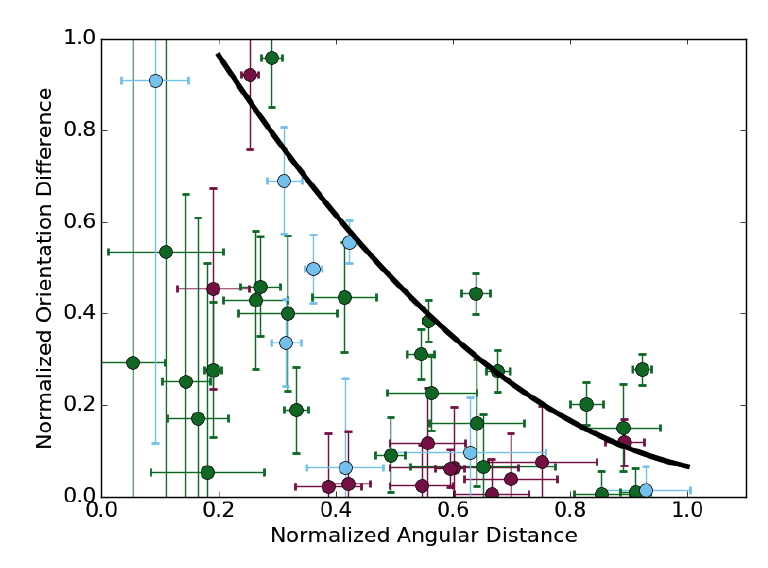 ForeCAT generally outperforms the GCS model, but is improved upon by performing a random walk with the CME width, tilt, and location (green and light blue lines). This shows that the accuracy of the FIDO output is limited by the accuracy of the ForeCAT output, and assuming reasonable departures from the ForeCAT output can yield even better FIDO results. Adapted from Figure 5 in the paper. The authors compare their model results to what ACE and Wind actually observed for each CME to see how their predictions fared. Figure 2 shows the modeled and actual magnetic field parameters for one of the 45 CMEs they modeled. They find that their model is able to reconstruct the observed magnetic field parameters well in most cases, with an average error of 30%. While predicting the magnetic field parameters of Earth-impacting CMEs is critical to estimating the severity of the geomagnetic storm, it’s also important to be able to predict whether or not a CME will impact the Earth at all—well in advance of its arrival. The authors use two parameters—the angular distance between the Earth and the CME and the angular tilt between the Earth-CME line and the CME’s toroidal axis—to determine whether a given CME from their sample would be designated a hit or a miss based on their ForeCAT results. Figure 3 shows the results of the impact-or-miss analysis for the 45 CMEs modeled here. In general, the model correctly predicts whether or not a CME will hit the Earth. However, the line dividing hits and misses is sensitive to the width of the CME, which is often difficult to measure accurately, so the authors propose giving a likelihood of impact rather than reporting a definite yes or no. Someday, weather forecasts might read a bit differently: 75% chance of precipitation, 40% chance of CME impact. Figure 3. Orientation of the CME versus the angular separation between the CME and the Earth. Purple symbols represent narrow CMEs, blue symbols represent wide CMEs, and green symbols fall somewhere in between. Points falling to the left of the black line are predicted impacts. Adapted from Figure 10 in the paper. The authors expect that with further development, ForeCAT will be able to forecast the likelihood of a CME impact given information about an active region on the Sun. From the range of likely CME parameters that ForeCAT produces, FIDO can determine the magnetic field parameters at the Earth. These predictions can in turn aid efforts to lessen the disastrous effects of geomagnetic storms. Looking ahead, CME forecasting models like ForeCAT and FIDO could be used not only to predict CME impacts on Earth, but on any planet or spacecraft in the solar system. Advance warning of CME impact will be critical for protecting astronauts bound for Mars and beyond as humans leave the protective confines of Earth’s magnetosphere and make the push into deep space. Featured image courtesy of ESA and NASA/SOHO.